I knew this was coming and I would rather tackle it sooner than later. I have sprinted through the easiest part of my novel – the first one third. It was fun to write. The scenes did not carry much burden, plot point or tension and thus, words flowed like a less viscous liquid. I did almost 11.5k words in the first four days. That was impressive by my own standards. 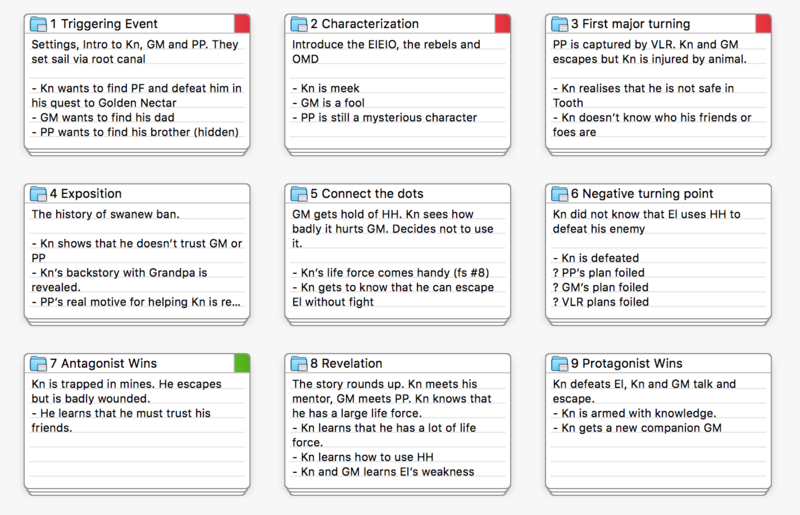 It just gives me confidence that if a sequence of events is plotted out, I can easily expand them into scenes. If you see the image above, the first three blocks, marked in red, are over. These are the ones that set the tone and mood for the novel. The green block is the segment I am currently writing. This is a difficult piece but not as difficult as the middle. I was so slow that I couldn’t even finish the recommended daily quota of 1667 words! I had finished re-reading all 20 volumes of Bakuman yesterday and did not have a comic book to distract me, either.